From the wilds of Canada (and currently residing in Florida) comes this unique bike not see in the States. 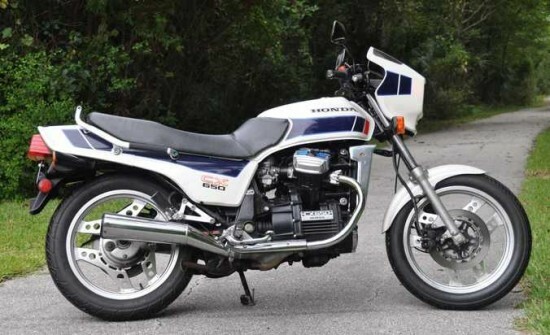 Evolved from the CX500 series of bikes which paid tribute to the Moto Guzzi choice of engine configuration, the CX650E was the basis for what became known as the CX650 Turbo here in 1983. 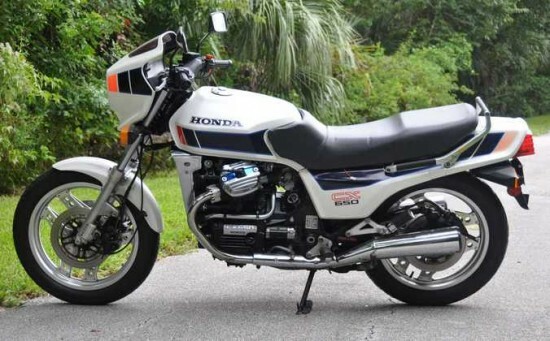 But instead of the fully-faired sport-touring treatment as we received in the US, other markets had access to this decidedly more cafe-racer style of bike. It is interesting to note the similarities between this “E” model and the Turbo. The wheels are the same as is most of the bodywork – aside from the fairing. This model offered a locking glovebox in the tail section that was not on the Turbo (that space was needed to house the fuel injection computer), and the dash looks remarkably similar (minus the boost gauge). One can certainly see the lineage of the Turbo when looking at this bike! Very nice Honda brought onto the continent through Canada. 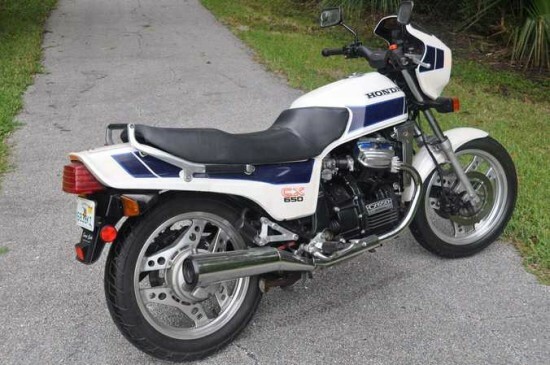 Same general format as the CX650T turbo, but without the heat, bother, spool-up time, and low reliability of the turbo bike. Pulls from down low and right now. Smooth and powerful at interstate speeds, handles more like a sport bike in the twisties. A near perfect all-arounder. Liquid-cooled and shaft-drive: with proper maintenance this bike should go well over 100K miles with no major expenditures. No issues other than an intermittent squeak in the rear suspension somewhere, and faded graphics. Otherwise starts, runs, shifts, stops perfectly. And looks great doing it. This is a great motorcycle we should have had here in the States. The seller has also included a short video of the bike starting up. I must say that the v-twin sounds very good indeed – much better than the Turbo at idle, which is very quiet. One known area to watch for on these motors is the stator – which is one of the components of the charging system. The stators on the Turbo bikes tend to fail at approximately 20k mile intervals, and replacing them is an involved “pull the motor” sort of process. Additionally, the wiring around the connectors can be suspect; look closely for burned or charred wires (especially behind the side panels) when doing an inspection.
. And don’t forget to leave a comment and let us know your thoughts on this one! Previous story Which BSA A65 is for you?